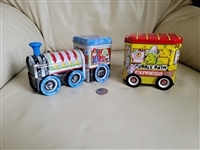 Bubble Bath Express tin money bank cart. 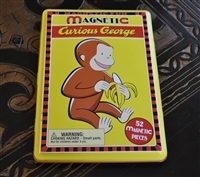 Magnetic Curious George set in tin box. Magnetic toy set from Curious George. Hungry Jack Pillsbury storage vintage tin. Advertising tin for Hungry Jack from Pillsbury Co.
Coca Cola milk carriege tin container. Vintage milk carrier shaped tin from Coca Cola. Van Camp's Pork and Beans 1986 recipe tin in colorful design and lifted up lid. Vintage lidded tin from 1986 Recipes Van Camp's Pork and Beans. Vintage lidded tin box Mrs. Leland's Old Fashioned Golden Butter Bits with plastic lid 1958. Mrs. Leland's Master Kitchens Old Fassion Golden Butter bits empty tin from 1958. Beautiful vintage paper mache round trinket in unisex colors of black, burgundy, white design for jewelry or small items storage or decorative purpose. Vintage lidded Cookie tin box in embossed floral design made in Holland. Amazing flowers embossed vintage lidded tin made in Holland. English DAHER baret ware tin in floral and geometrical design, sign on the bottom. Decorative DAHER ENGLISH baret wear tin in floral and geometrical design. The Real Santa round tin from 1979, Miss King's Limited. Limited edition Miss King's round tin with Santa. Currier & Ives Arby's collectible glass from 1981 Winter Pastime and Danish Butter Cookies tin from Jacob's Bakery. Vintage wooden Folk Art decorated wooden storage box with floral hand painted decor. Vineage wooden box in hand crafted floral design Folk Art decorative display. Debra Jordan Bryan Welcome New Baby vintage set with cards, paper, photo frame, etc. New Baby gift set in blue color with thank you cards, album, photo frame, envelopes and decorative box from Debra Jordan Bryan. English vintage pedestal lidded tin with colorful decorations. Round vintage decorative English tin in colroful floral design. Wooden dog vintage storage box in nesting doll style, trinket, storage box, or interior decor display. Vintage tin boxes from Golden Niagara Cream sugar corn, strawbery treat, and Trump's hoter, turnberry hotel - used. Vintage tin boxes, Trump's hotel Turnberry Scotland, Strawberry Treats Richardson & Robbins, Golden Niagara Cream Sugar corn, pre owned. Vintage Murray-Allen tin box from England and German Wilklein Nurnberger tin box set. Vintage German Wirklein tin box and English Murray-Allen tin box, set of two. VIntage English tin boxes peacock by Daher and Murray-Allen basket tin box. English tins boxes set, Peacock By Daher and Murry-Allen basket. Vintage Panda Bear Chinese Chime Baoding Health Balls in box. Vintage Panda Bear Chinese Chime Baoding Health Balls in box. Nice weight with an amazing chime sounds plus gold tone accented design borders over marbled blue background. Each ball is 1-7/8" in diameter. Linnen covered box provided, gentle wear. Hand wrought Creation by Rodney Kent 439 silent butler tulip aluminum pan. Vintage TULIP design aluminum pan or storage silent butler from Creations by Rodney Kent 439. Classic Car 3D tin box design by Silver Crane, London decorative storage from Jacobsens Bakery Denmark. Amazing 3D classic cars empty tin design in Silver Crane London produces by Jacobsens Denmark. Cedar wood decorative storage box, Elk decoupage. Elk decorated cedar wooden box. Vintage colorful Delft Windmill decorated trinket storage box sing 34 Swe Dip Delft. Hershey's Kisses Money bank car 1995 and "A kiss for you" lidded tin 1982. Hershey's Kisses Money Bank car on wheels from 1995 and Vanity tin A kiss from your lidded tin. Wilson Wil-hold sewing supplies carry on boxes in shades of yellow set of two from 1970. Vintage hard plastic amazing storage boxes for sewing or crafting supplies Wilhold by Wilson Manufacturers 1970. Folk Art hand crafted Unicorn horse on wooden stand pens and pencil holder. UNICORN horse hand crafted pan and pencil holder Folk Art style decor. Slade's Caramel Toffy large lidded tin with Crystal Spring decor 1950. Slade's 1950 Caramel Toffy tin with Crystal Spring decor lidded tin box. Wilson Wil-hold plastic storage box with inner shelf for sewing, crafting supplies in mustard yellow color, clear lid. Organizing storage box from Wilson MFG Wil-hold box in mustard color and with inner shelf. Ringling Bros. and Barnum & Bailey circus elephant mugs from 1988 and 2005 and 129th edition porcelain cup. Elephant Circus Mugs from Ringling Bros & Barnum & Bailey from 1988 and 2005.